If you've been following our blog then you know that there are some races that we do plan way in advance (like Disney races) and then there are others we ended up doing at the last moment because we like to play it by feel. Although I love Disney races, I kind of like when I can sign up for a race during that same month. So with that being said, here is our tentative race plan for the rest of the year. Of course we may throw in a few smaller races as they come up. This is a compilation of both of our race schedules thus far. Lewisburg Lights 5K (possibly) This is a night time run so should be fun. Would love to find a Halloween theme race. Will you be running any of these races? Do you have any suggestions of races we should run this fall? Well looky there: Chicago Marathon! Wendy and I will be at mile 13 cheering for you! Fun schedule! I did the Virginia Beach half several years ago. I really enjoyed it. I'm doing Monumental half in Indy in November. Highly recommend. It's always great fall weather and a nice flat course. And I love the Santa Hustle series. It comes to Indy in December. Fun and festive. I have never done any races in Indy. You're doing Chicago! That's great! I want to do that one some day. I haven't done any Disney races because they're pretty pricey with registration, travel and everything. I have a much quieter race schedule this fall than last year. Disney races are one of our favorites but they are very pricey. I had no idea you girls were running Chicago. I'll be there too with my hubby as my cheerleader. Lacey will be there running. See you ladies at Wine and Dine! I'm so excited to experience a new to me Disney race weekend. We are excited to finally be able to do it. Too bad it is still not a night race. Sounds like you have an exciting line up with Chicago and Wine and Dine! I do like those races you can sign up for at the last minute. They are always nice. Too bad Disney isn't like that. You're doing the Chicago Marathon? That's so exciting. I always said I would love to go up there one day & do a race. It seems like such a cool city. I have never been to Chicago so I'm really excited about that race. Looks like an exciting lineup - Virginia Beach, Chicago, Wine & Dine! I only have one race planned for the fall, a local half marathon. I might also do a Turkey Trot but it depends on the weather. Virginia Beach is a local one for me that's why I am doing it. What a great roundup of races! Very excited about Chicago for you! Thanks Julie. After reading your post the other wk about it makes me more excited. I'm running Virginia Beach RnR half! I've never been to Virginia Beach and I'm nervous! Yay! Don't be nervous. It's a great course. Mostly flat besides the bridge. Yea it is always a hot race! We have similar, though different schedules. Instead of Wine & Dine, I'm doing Disneyland this weekend. Instead of Chicago, I'm running New York. Looks like a great race schedule and can't wait to hear about all of your adventures! I would love to run New York some yr.
Looks like some great races coming up in your schedules! I just cancelled my plans for my fall marathon, not sure if I will be running any others unless I can score some free race entries I am starting to realize life as a penny saving college student has it's drawbacks when it comes to running! They sure do get expensive. That is a heck of a lot of racing and traveling. Didn't realize you were doing Chicago. Virginia Beach would be nice too ! Jealous you are doing wine and dine! Maybe next year for me. I haven't done it since 2013! I love Halloween races! When Wine and Dine was at the end of September, the 5k was Halloween themed and the Disney characters were dressed up in costumes. That sounds like a really fun fall! Fall racing season is definitely my favorite thing! You've got a great plan! It will be fun to follow along as you train! YAY for Chicago, bummed I am working so won't be able to come cheer you on! Good luck for all your races! I totally hear you about the joy of being able to sign up for a race at the last minute, instead of having to plan months and months in advance for the Disney races. So cool that you'll be running the Chicago Marathon! Unfortunately I'll be in DC that weekend running the Army 10, otherwise would so love to meet up with you!!! 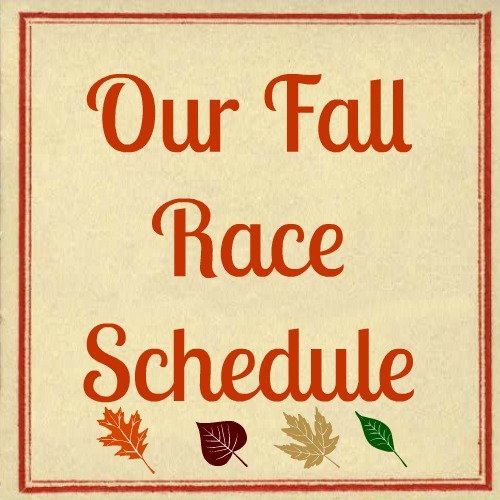 You've got such a fun race schedule coming up this fall. The Running of the Elves sounds intriguing! Chicago marathon! I won't be here for the race itself, but I will be back that night. I would love to see you! I've never been to Virginia Beach but I've heard it's so beautiful! I haven't done any theme races and I have yet to sign up for Chicago. But thanks for the prompt to add them to my ever-growing list! Holy wow- that's a lot of racin'! Have the best fall! One of these years I need to get to the VA Beach race. Looks like you guys have a fun fall ahead. You have a pretty packed schedule! A Halloween race would be really fun if everyone was dressed up. I like last minute sign-ups, too! This looks like a really fun and busy race schedule! !